Scoliosis is sideways curvature of the spine, which can result in changes to your posture. Scoliosis can often be present without any symptoms and with no particular cause. Idiopathic Scoliosis is the most common type of scoliosis where no cause can be found. There has been research to suggest that an Idiopathic Scoliosis might be inherited. Information cited from: SOUZA, T. A. AND SOUZA, T. A. 2005 - Jones and Bartlett Publishers - Sudbury, Mass. Congenital means something that you were born with. Congenital Scoliosis is curvature of the spine that has been formed before birth, and is less common that other types. It affects around 1 in 10,000 newborns. It can also be associated with other health issues. Neuromuscular Scoliosis is a result of imbalance between the nerves and the muscles. It is frequently seen in people suffering with Spina Bifida and Cerebral Palsy. Degenerative Scoliosis is often referred to as Adult Scoliosis, as is typically seen in over 18 year olds and is due to degeneration of the spine. This can be a result of age or following trauma. Scoliosis is usually determined by physical examination of the spine through palpation and further orthopadic tests by a trained healthcare professional. Neurological examination will also take place to rule out any involvement of the spinal cord. A structural curvature is the end result of bone remodeling, and it does not correct with postural changes such as bending forward, lying down and supine. Functional curvature is corrected with postural movements, and is usually related to compensatory and/or a result of muscle spasm. An instrument referred to as the Scoliometer can be used to measure the angle of of inclination or trunk rotation. 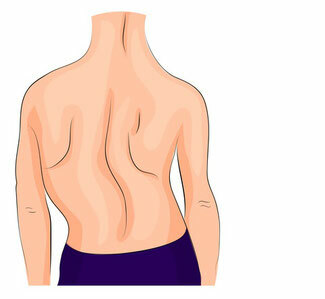 If the measurement is 5 degrees or more, then a Scoliosis can be assumed. If it is appropriate an X-ray may be taken in order to confirm diagnosis, and to evaluate the angle of the curve, or curves. The treatment of Scoliosis is usually based on the skeletal maturity, how close the patient is to finishing growing, and the degree of the curvature. Observation of the curvature is often done by an orthopedic specialist, and are done at regular intervals with physical examination to assess the progression. X-rays can also assist in the observation to monitor the angle of the curvature. Lateral Electrical Surface Stimulation – Surface electrodes are attached the skin and left over night, to provide an electrical stimulation of the muscles and help to reduce the curvature of the spine. The rate of success of this has not been fully understood. Bracing - This is a non operative method of management and is usually seen with curves of between 20-30 degrees. It is used when there is still growth in the bones. It aims to reduce the progression of the curvature. The effect of bracing has been criticized and this will need to be discussed with your Doctor. The amount of time that you wear the brace, and for how long would need to be confirmed with your doctor. Exercise - Exercises focus on abdominal strengthening, stretching the muscles on the convex side, and stretching the muscles on the concave sides. There is very little evidence to show that exercise alone can improve, reverse, or slow down the progression of the scoliosis. The type of exercises that would be given would depend on individual circumstances. There are benefits that manual therapy might bring to a patient with scoliosis. We work to reduce muscle tightness and weakness, and optimise the function of the patients joints. By allowing the spine to become more flexible it is potentially possible to reduce the progression of the scoliosis. We can also work as a natural form of pain relief by removing joint and muscle dysfunction, that may be resulting in pain. * Information cited from: SOUZA, T. A. AND SOUZA, T. A. Surgery is considered if none of the above is effective, or the curve becomes so severe. This decision will be made by your scoliosis consultant based on your 6-12 month checks. The main purpose of surgery is straighten and strengthen the spine. There are two types of surgery: Posterior Surgical Approach and Anterior Surgical Approach. Which type of surgery is determined by the type and location of curve. To summarise, there are different causes of Scoliosis and they can be symptom free in presentation. In order to diagnosis the Scoliosis we would recommend you visit a qualified healthcare professional in the first instance to determine the cause. Scoliosis can be managed with conservative care and surgery will only be considered if the non invasive methods are not effective.